Use Widgets to display a summary of rank performance, traffic and demographics data in a colorful graphic bar across the top of reports or use the standalone Widgets report in the Lab to combine a variety of widgets into one colorful report. Widgets can be displayed at the top of the Rank Tracker Dashboard and Weekly Snapshot reports, in white label Marketing Dashboards, Client Dashboards, and can be integrated into White Label PDF Reports. Present AdWords Transactions or Conversions in a colorful graph comparing Ad Clicks to Goal Completions for the previous 30 days, along with a summary of sessions, ad cost, clicks, number of conversions, conversion rate and goal value all compared to previous period. The default for this widget is Transactions, but if there aren't any then the widget displays Conversions. The Analytics Demographics widget displays location, age and gender demographics of the visitors to the primary domain during the past month. In order to view age and gender data, the domain must be using Universal Analytics. The Analytics Overview widget presents Analytics data for the past month including domain traffic, the top channels referring traffic to the site and a breakdown of traffic by device type - Desktop, Mobile or Tablet. The Keyword Performance widget shows an overview of the performance including average daily, weekly, monthly and overall Keyword Change, current Keyword Positions and overall keyword position Gains & Loss. The up and down numbers in the Keyword Change section represent the number of keywords that experienced rank change between the report date and the previous day, week, month and overall since the beginning of the campaign. This metric includes all of the selected search engines (refer to the Report Options > Search Engines to view or change the number of search engines in the report), for example, if the campaign is tracking 100 keywords on 2 search engines, then it is possible to see up to 200 position changes in the Daily section. The Gain & Loss section is similar in that it includes data for the selected search engines, it provides the total number of keywords that had rank change from / to positions 1, 2, 3 and the Top 10 since the previous day. The Organic Page Count widget displays the trend of organic traffic and number of unique landing pages over a 12 month period. The Performance Summary widget provides an overview of your site's performance showing rank distribution of keywords in the campaign, the visibility score for the primary domain and the website's traffic during the past month. In order for the widget to display Traffic data, the campaign must be properly connected to Google Analytics. Classic SEO Widgets can be shared in white label Client Dashboards that provide your client with hands-on interactive reports, by checking the Classic Widgets option in Campaign Settings > Client Dashboard, Graphs & Widgets section. To configure which widgets display when your client is logged into their dashboard, open the Reports > Graphs section, and Classic Widgets, select the widgets you want displayed and then Save as Default Client Dashboard settings for the campaign. Individual Classic SEO Widgets can be added to Marketing Dashboards anywhere you'd like to display them, by following the instructions for adding reports to dashboard pages. Learn more about the differences between Client Dashboards and Marketing Dashboards, and choose the one that is best for your business. Click the calendar icon to select the report date range. Enter a custom report title, if desired. 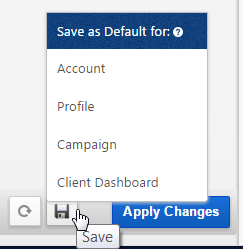 After selecting the widgets that you want displayed, you can save them as Default for the whole account, a profile, the campaign, or a Client Dashboard for the campaign. PDF Report Content screen, then click the Add Report button and select the Campaign name and Report: Classic Widgets. Display Widgets by moving the slider to the right of each selection. Keyword Performance: an overview of the performance including average daily, weekly, monthly and overall Keyword Change, current Keyword Positions and overall keyword position Gains & Loss. Rank, Visibility & Traffic: an overview of your site's performance showing rank distribution of keywords in the campaign, the visibility score for the primary domain and the website's traffic during the past month (in order for the widget to display Traffic data, the campaign must be properly connected to Google Analytics). Analytics Overview: presents Analytics data for the past month including domain traffic, the top channels referring traffic to the site and a breakdown of traffic by device type - Desktop, Mobile or Tablet. Analytics Demographics: displays location, age and gender demographics of the visitors to the primary domain during the past month (in order to view age and gender data, the domain must be using Universal Analytics). Organic Page Count: displays the trend of organic traffic and number of unique landing pages over a 12 month period. AdWords Overview: compares Ad Clicks to Goal Completions for the previous 30 days, along with a summary of sessions, ad cost, clicks, number of conversions, conversion rate and goal value all compared to previous period.